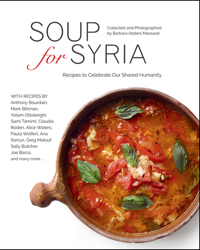 Interlink Publishing, a Massachusetts-based independent publishing house, has collaborated with bestselling cookbook author, photographer, and food writer Barbara Abdeni Massaad (Man’oushe: Inside the Lebanese Street Corner Bakery)—together with nearly 80 acclaimed chefs—on a humanitarian cookbook project whose profits will be donated to the UN Refugee Agency UNHCR to provide urgently needed food relief for Syrian refugees. Plenty of chefs have donated their recipes – chefs like: Yotam Ottolenghi, Claudia Roden, Mark Bittman, and many others from around the world. Simply buy the book yourself – who doesn’t like a great bowl of soup? Then, do more. Host a soup party. Get others to buy copies. Or click here for plenty of other suggestions on how to raise hope and food and humanitarian aid to the Syrians who are caught in the catastrophic disasters afflicting their country.